Thick, rich BBQ taste that you can't help but get all over the face. 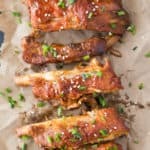 No one can resist Slow Cooker Fall Off The Bone Ribs, beer barbecue style! Combine paprika, onion powder, sugar, garlic powder, salt and pepper in a large bowl.